Beautiful strapless sweetheart gown with lovely long train and lace up back. Stunning lace and bead detail that catches the light beautifully and ribbon under bust. Pleats at top of skirt and eyelash lace detail on sweetheart neckline. 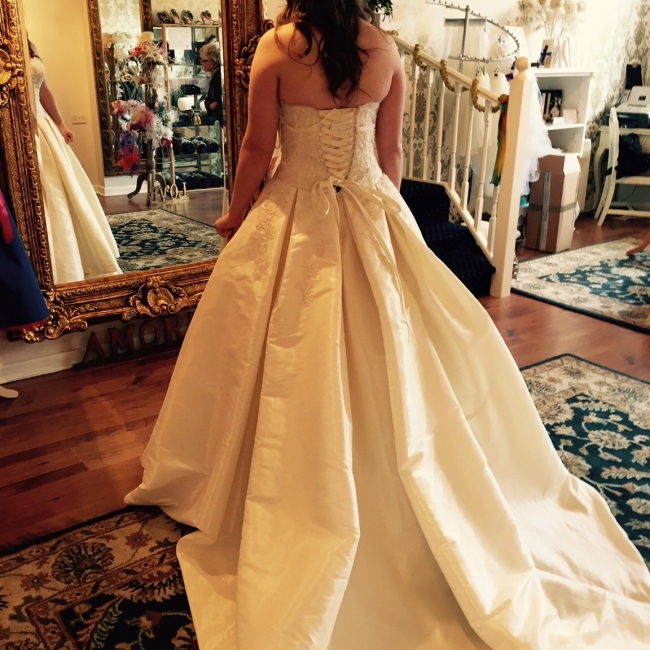 Dress is a sample gown with tags still attached and has not been altered. Has been stored so it is a bit creased so would need dry cleaning. Tag states US12 (UK14) but I am a size 10/12 and it fit me fine and gave a lovely silhouette. Lace up back means it is versatile so could fit different sizes. Optional modesty panel included.